Meena Harper has a special gift, but it’s only now that anyone’s ever appreciated it. The Palatine Guard—a powerful secret demon-hunting unit of the Vatican—has hired her to work at their new branch in Lower Manhattan. With Meena’s ability to predict how everyone she meets will die, the Palatine finally has a chance against the undead. Sure, her ex-boyfriend was Lucien Anton­escu, son of Dracula, the prince of darkness. But that was before he (and their relationship) went up in flames. Now Meena’s sworn off vampires for good . . . at least until she can prove her theory that just because they’ve lost their souls doesn’t mean demons have lost the ability to love. Meena knows convincing her co-workers—including her partner, über-demon-hunter Alaric Wulf—that vampires can be redeemed won’t be easy . . . especially when a deadly new threat seems to be endangering not just lives of the Palatine, but Meena’s friends and family as well. But Meena isn’t the Palatine’s only hope. Father Henrique—aka Padre Caliente—New York City’s youngest, most charming priest, has also been assigned to the case. So why doesn’t Meena—or Alaric—trust him? As she begins unraveling the truth, Meena finds her loyalties tested, her true feelings laid bare . . . and temptations she never even imagined existed impossible to resist. This time, Meena may finally have bitten off more than she can chew. Meg Cabot (her last name is pronounced CAB-bit) is a #1 New York Times bestselling author of books for both adults and tweens/teens. Her Princess Diaries series was made into two hit movies by Disney, sold over 15 million copies, and has been translated into 38 languages. Meg also wrote the Mediator and 1-800-Where-R-You? series (reprinted under the title Vanished, and which was made into the Lifetime series called Missing), as well as numerous other stand-alone books and series. An original movie based on her book Avalon High is to be broadcast on the Disney Channel in Fall 2010. Meg’s newest series include the tween hit Allie Finkle’s Rules for Girls, a sci-fi/rom-com YA trilogy (Airhead / Being Nikki / Runaway), and the Heather Wells mystery series for adult readers (Size 12 Is Not Fat / Size 14 Is Not Fat Either / Big Boned). Insatiable, Meg’s first paranormal romance for adult readers, makes its debut in June 2010, and Abandon, the first book in her new paranormal romance series for young adult readers, in April 2011. Though many people don’t believe it, Meg really does write all her books herself. She does this by writing them one at a time, with frequent breaks for M&Ms. Meg appreciates gifts of bags of M&Ms at her book signings. Meg divides her time between Key West, Indiana, and New York City with a primary cat (one-eyed Henrietta), various back-up cats, and her husband. 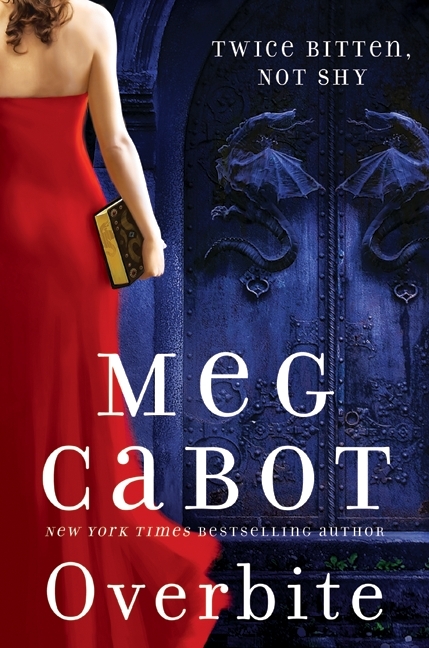 Meg Cabot's OVERBITE is the sequel to her highly successful INSATIABLE. The main character is Meena who has some strong powers such as being able to tell when someone is going to die. In the beginning of the story, Meena is working for the Palatine, and living in a secret location in case Lucien, from the first book, might be looking for her. Lucien is the vampire King and Meena still feels there is good in him and would like to prove it. Lucien is in hiding as he tries to figure out if he does have good in him like Meena believes or if instead, he is truly his father's son, filled with evil. He fights evil temptations trying to be perhaps what he was never meant to be. Meanwhile, Meena has more problems as she meets with her former boyfriend and tries to decide how to tell him about the nightmares and that she is pretty sure he is about to die when suddenly, everything spins out of control. Meena is sent off to on a mission and while she is doing this, she is being closely guarded by Alaric who is her partner as well as having Lucien keep tabs on her. Meena realizes that this time, it is personal as not only are the Paletine in danger but those she holds dear and loves herself. As I have reported before, this paranormal/urban fantasy genre is not my specialty by any means but OVERBITE is one book I enjoyed. I am sure it has a lot to do with my liking the way Meg Cabot writes. She doesn't take herself too seriously with all this vampire stuff and by having this humorous vein running through the story, it keeps the very serious and dark parts from being too heavy for me personally. There is a good bit of mystery and even a part I never saw coming that made for a nifty twist. It is an easygoing, fun read and I am sure Cabot's fans will enjoy it a great deal. TO GIVE AWAY TO LUCKY READERS! I've read some of Cabot's other books and would love to give this a try! Thanks! Something fun is that Meg likes the tv show The Office! I liked her diary entry about the dog days and the news that there will be another Heather Wells book out in 2012. That's great news! I love paranormal books, so I'd love to win this one! On the Harper Collins site, Meg says she wishes for more Dove bars. I wonder if she means the soap kind or the chocolate kind?? I like the review and plan on reading the first one and would like to read this one also. I love the pic of Meg in her crown and boa. I have not read any of Meg's books but have heard many good reviews. Maybe it is time that I dive in! I learned that Meg's favorite clothing is yoga pants. I went to Meg's website and entered her giveaway for Insatible. I have not read many paranormal romance novels, but the review of Overbite makes it sound like it would be a fun read. I really enjoy Meg's books and have been looking forward to this series. Thanks for the giveaway! Meg's favorite food is homemade chocolate chip cookies! Meg was an assistant resident hall director at NYU for 10 years. This one sounds like a fun book to read. I like this genre quite a bit, and it sounds like a good series. I have heard such good things about Cabot's book. Thanks for the giveaway. I enjoy reading Meg Cabot's books! She always writes the best books! Thanks for the chance. I learned that Meg Cabot's fave food is Chocolate Chip cookies (I learned this from the Harper Collins site). When I visited Meg Cabot's site I remembered that she wrote the Allie Finkel Series of kids books. My daughter and I love these books!